1 Natural Remedies For Depression – What About Vitamins? Natural Remedies For Depression – What About Vitamins? With the widespread appeal toward more organic types of treatments, many who suffer from depressive disorders opt for natural remedies for depression. And once they start their investigation, they uncover a variety of available choices open to them. With thousands of people suffering from depression all around the world, the symptoms are quite well known. They include feelings of sadness, irritability, tiredness and a lack of interest in activities that otherwise were quite enjoyable to them. Depression can be brought on by chemical imbalances in the brain from a variety of sources or can even come on following an extremely traumatic or stressful situation. It’s even been found to be triggered by a vitamin deficiency in some individuals. And many of these folks have responded well to natural remedies for depression that include a vitamin regime along with other more traditional forms of treatment. No matter what the cause, changing your lifestyle can go a long way on that road toward recovery. Making healthy changes to your diet, adding vitamin supplements for the ones you might be lacking along with healthy doctor recommended exercise have all been shown to improve a person’s mood and bring about more positive thought processes. All of these are considered natural remedies for depression as they can help lift the mood of many suffering from a depressive disorder. The B vitamins for depression are essential to our mental well-being and emotional, so they can help relieve the effects of depression. Vitamin B1 helps fight against depression and anxiety by transforming carbohydrates into energy. Lack of vitamin B1 can cause fatigue, depression, irritability and anxiety. Vitamin B1 deficiency can also cause memory problems, impaired appetite, and insomnia. Vitamin B1 is found in the envelope of the grains, and is thus found in most fruits and vegetables. The lack of vitamin B3 can cause the anxiety, stress and feelings of restlessness. The vitamin B3 is found mainly in foods such as eggs, milk or poultry. Symptoms of vitamin B5 deficiency are fatigue, chronic stress and depression. Vitamin B5 is involved in the creation of certain hormones and proper functioning of the nervous system in the brain, which helps to fight against certain types of depression. Vitamin B5 is wholemeal bread, nuts, oranges, meat, egg yolks and grains. Vitamin B6 helps the production of serotonin, melatonin and dopamine in the body and ensures all our vital functions. One of the side effects of antidepressants like MAOIs is precisely to cause a decreased level of vitamin B6. This is why food precautions should be taken when using MAOI antidepressants during the depression to avoid deficiencies in vitamins B6, which can cause skin damage and dizziness. Vitamins B6 are in good supply in poultry, liver, salmon and cod. Vitamins B12 allow the formation of red blood cells in blood and vitamin B12 deficiency causes a form of anaemia called pernicious anaemia (oxygen is difficult to be carried in the blood). Deficiencies of vitamin B12 are very long to form as our liver stores reserves for three to five years. This storage capacity decreases with age; this is why the elderly are more likely to have vitamin B12 deficiency. Vitamin B12 is found mainly in meat and fish. They practically do not exist in vegetables and plants, which cause problems for people vegan. Folic acid helps our body to synthesize DNA and amino acids. Poor eating habits and alcohol and drugs cause vitamin deficiencies B9. B9 vitamin deficiencies increase the risk of anaemia, anxiety and depression and its level should be monitored especially in cases of alcoholism and depression combined. In general, folic acid is found in very small amounts in our diet, so it is sometimes recommended to be taken as supplements. Vitamins B9 are still in green vegetables, eggs and whole grains. We would also like to add C vitamins for depression, since Vitamin C helps keep the good function of our immune system. Vitamin C is found mainly in fruits and vegetables. The FDA recommends a daily intake of 110mg for adults (one orange provides 50mg of vitamin C). Are you aware that a shortage of vitamins and depression may be linked, especially if your body isn’t receiving enough nutrients from the food that you are eating? There are certain multivitamins that will steadily boost your mood at keep it consistent if you digest vitamins and all of the necessary ones into your body every day. If you’ve yet to recognize the importance of the “b- complex vitamins,” then you are not digesting a vitamin that increases your emotional and mental consistency. These nutrients cannot store itself in our body significantly and it often depends on our diet; but, it can be destroyed easily with alcohol consumption, with an excessive amount of sugar and a lot of caffeine which isn’t uncommonly consumed with each day. Thiamine is a vitamin that helps the brain to change blood sugar into fuel so that we can use resourcefully. If our brain doesn’t convert this glucose into bodily fuel then we may undergo a lot of fatigue, depression, anxious feelings and suicidal thoughts. This may also result in memorization problems, a decrease in appetite, problems sleeping and digestive problems. Sugars will leave the body starving for thiamine, or B1. A shortage of Niacin or the vitamin b3 will result in an individual who experiences psychosis and agitation. They may not be as sharp when it comes to reaction time and their bodies may feel tired or slow. Vitamin B5 deficiency will result in a lot of stress and depression, being that it maintains our hormones and the amino acids in our brain. Vitamin b6 is also a nutrient that helps us and our amino acids to increase the healthy proteins in our body and keep our hormones consistency. This is one of the most important of supplements being that it is needed to keep the melatonin and dopamine working in full force. There may be an increase in confusion and skin problems with a lack of pyridoxine (vitamin b6.) A shortage of vitamins and depression is linked because it will lead to a bodily deficiency in the proteins and the extra nutrient that our body needs to deliver messages appropriately and at the time in which we need it most. When our mind and our body are not in sync with each other then we will misconstrue ourselves and grow more confused because of or inability. Vitamin B12 is vital because of the way that it affects the red blood cells within our body. Without b12 our moods may swing immensely and we may experience more mania or loss of appetite. The vitamin b12 is also known for sustaining our “youthful” appearance. If we are short of folic acid then we are not producing illness fighting antibodies, as we are exposed to bacteria often. If we are not eating correctly we will also experience a lack of folic acid. Women who are undergoing a pregnancy are highly recommended to taking folic acid so that they are receiving enough nutrients for themselves and their baby. Anxiety attacks affect millions of people around the world, but natural treatments are available to deal with it. Learn the best vitamins for anxiety and how to properly treat this condition. Vitamins for anxiety can provide relief from anxiety attacks without any side effects, which is what people worry most about with artificially produced drugs. Have you never noticed that the ads for prescriptions often list more side effects from the medicine than the benefits? Second, vitamins are more affordable and come with other health benefits. All vitamins are beneficial of course, but as far as anxiety treatment goes the following are the most potent. Helps to prevent the abnormal growth of cells, supports heart and immune-system functions and maintains eye health. Vitamin B relates primarily to maintaining a healthy nervous system. There are a variety of Vitamin B types, such as folic acid, riboflavin, cobalamin and thiamine. This vitamin promotes the healthy production of neurotransmitters. Vitamin C is useful for regulating cortisol secretion in the body. Cortisol is needed for the fight or response the stressful situations, but can be unhealthy on a regular basis. Cortisol is released by the adrenal gland and sends stress signals throughout the body and mind. Typical recommended dose for vitamin C, as presented by the RDA is 60 mg, but the dosage is based on the levels during the age when scurvy was a problem. Higher levels are recommended for reducing stress. In a study published in the International Journal of Sports Medicine, vitamin C was most effective in regulating the adrenal stress hormones on 1500mg per day in athletes. Vitamins that help with anxiety also include vitamin D. Although your body produces it naturally, this only happens after being exposed to the sun and it is dependent on season and geographical location. Fortunately you can get vitamin D from cod liver oil, mackerel, salmon and other fish. As one study pointed out, vitamin D can help you fight off depression and anxiety. Another recently concluded study revealed that people with vitamin D deficiency often suffered from depression and / or anxiety. However, the benefits of vitamin D aren’t limited to relieving stress, as it also provides protection for your bones, prevents cancer and improves your body’s immunity. If you lack vitamin D you’ll feel physically weak, so make sure you get around 2,000 to 5,000 IU per day. There’s also research that indicates vitamin D is best taken after your heaviest meal for optimum results.Omega-3s and Omega-6sVitamins to help anxiety are effective, but it won’t hurt to include omega-3s and omega-6s. Found in fish oil (DHA and EPA), omega 3s and 6s have been scientifically proven to be effective in treating anxiety and depression, but for the best results you should eat a lot of fish and take fish oil supplements too. The ideal starting dosage is 1,000 mg of omega 3 daily or more. If you eat lots of salmon and mackerel then you probably don’t need to take a lot of fish oil supplements, but if fish isn’t a major part of your diet then some will be necessary. Due to the popularity of omega 3, numerous “fish oil” products have appeared so you should examine the product label carefully to ensure that it’s genuine. Helps to regulate the clotting of blood and calcium levels, maintains bone and teeth health. Calcium and magnesium are among the best vitamins for anxiety because of their calming effect. Magnesium in particular has a soothing effect on your nervous system and prevents irritability, restlessness, nervousness and fear, all symptoms of anxiety attacks. In addition, magnesium and calcium protects your arteries and heart, very important if you frequently suffer anxiety attacks on a regular basis. Magnesium and calcium also work well together with vitamin B6, and they provide relief for PMS, weight gain and pain. You don’t need to take a lot of magnesium to feel the positive effects either, as just 200 mg will be enough. However for maximum benefit, you should take 800 to 1,200 mg of calcium and 400 to 600 mg of magnesium every day. However, there’s nothing wrong with taking more than the recommended dosage of magnesium especially if you suffer from anxiety attacks. Some take as much as 1,000 mg of magnesium a day, so feel free to experiment. The most common symptom of too much magnesium is the stools become loose, so if you experience that you need to cut back on the dosage. If you’ve been diagnosed with an anxiety disorder and want to try vitamins for stress and anxiety, don’t forget L-theanine, an amino acid that produces a calming effect on the mind and cuts down the physiological effects brought about by anxiety. L-theanine also stimulates the GABA levels in your brain, thereby making you feel calm. In addition, L-theanine has special properties that provide additional protection against neuro toxins. For the best results, a dosage of 50 to 200 mg will be necessary. Lactium on the other hand, is a supplement from casein protein found in milk. There were claims in the past that it was effective in treating anxiety, but it’s only recently that this has been proven true. According to the latest research, lactium reduces the symptoms of anxiety, stress and also reduces your body’s cortisol hormone level, which is responsible for generating stress. 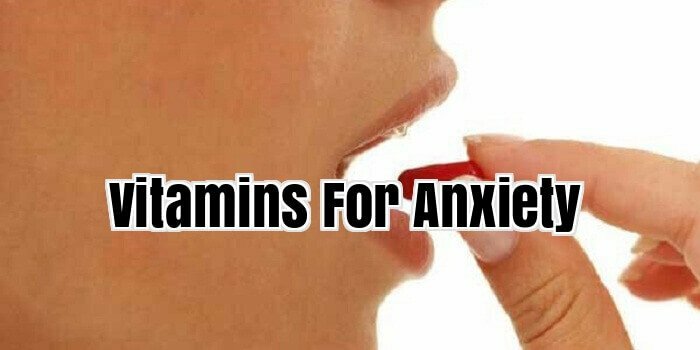 If the vitamins for anxiety mentioned above don’t work, you should give Anxietin a try, as it’s a 100% natural homeopathic formula that can treat different types of anxiety attacks. The medication has 21 ingredients specially chosen to give you maximum relief from anxiety and stress. Because it is all-natural, you don’t have to worry about any long term side effects or artificial flavours. Apart from providing relief from depression symptoms, you also get relief from panic attacks and other similar ailments, and there are no harsh sedatives here.